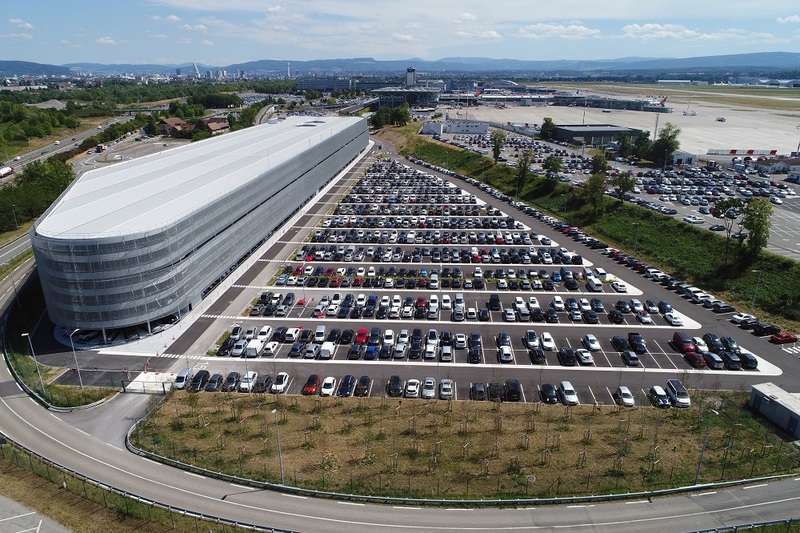 EuroAirport Basel-Mulhouse-Freiburg international airport, situated on the Franco-Swiss border, has witnessed a steady growth in traffic over the past few years. To accommodate this, a new six-storey car park with an impressive 2,700 places was opened in March 2017. 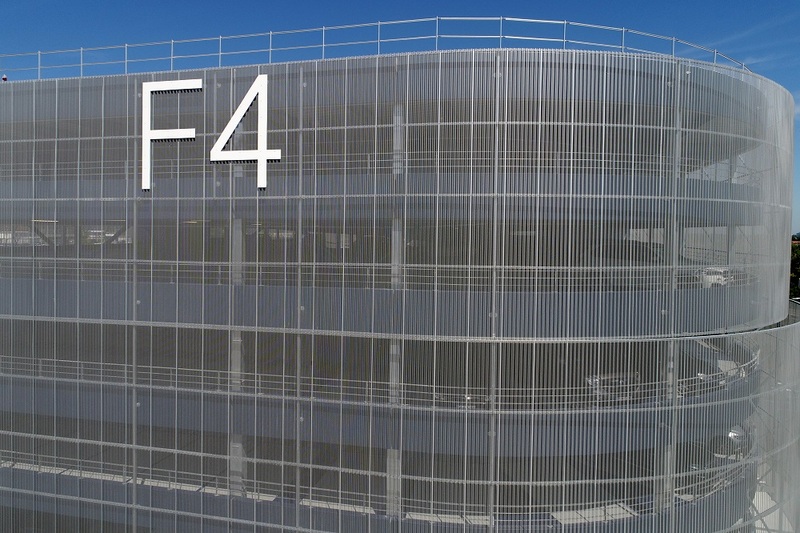 It immediately became apparent that the architectural design of this new F4 car park would be very important. The façade would need to be sleek and coherent, within a high-calibre structure that would line up with the main terminal. It would be visible from the motorway, thus marking the way into the airport site. 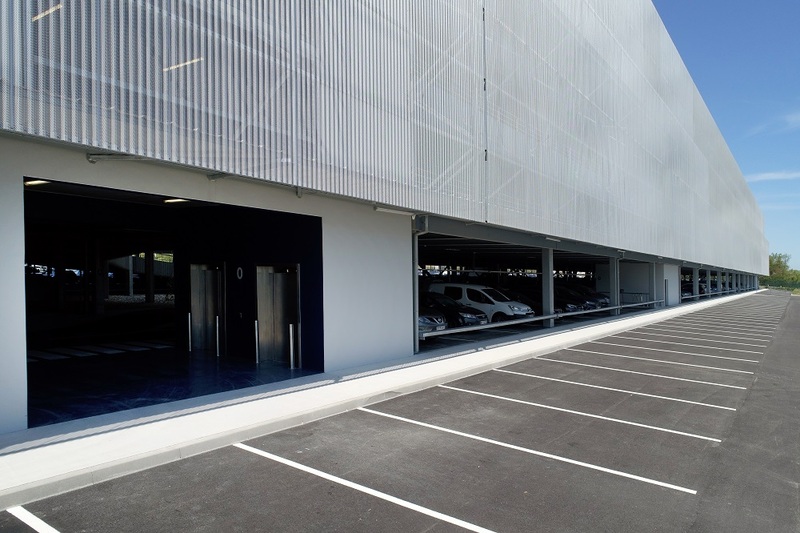 EuroAirport management commissioned the Gagnepark/DeA architectes/Eiffage/Clemessy/Egis group to design and build the new car park. The Gagnepark proposal was accepted because it was functional, blended well with the surrounding architecture, urban landscape and countryside, was easy to maintain and used high-quality, durable materials. The façade is made from an imposing steel mesh that catches the light during the day. At night, the artificial lighting inside can be seen from outside, giving the structure the look of a gigantic lantern. The effect is quite magnificent and the building inevitably catches the eye from every angle. Gagnepark set about looking for a preferred supplier on the French market that could create this beautiful, high-tech façade. Joris Ide, a company known for its expertise in façade solutions, was selected to carry through this ambitious project. The project was not without issues for Joris Ide. It was quite a challenge to combine over 50% surface perforation, for good natural ventilation in the car park, with the very specific fluid geometry and rhythm of the profile, all within a very strict budget and with a requirement for an extended lifetime. From the three available options – stainless steel, aluminium and Aluzinc® – Gagnepark selected Aluzinc® Florelis made by ArcelorMittal Europe – Flat Products. “We really like Aluzinc® Florelis because of its remarkable technical and aesthetic qualities. It can be easily bent, profiled and deep drawn to meet complex parameters, while retaining the finest nuances of the steel,” commented Jean-Christophe Jomain, Commercial Director at Joris Ide. 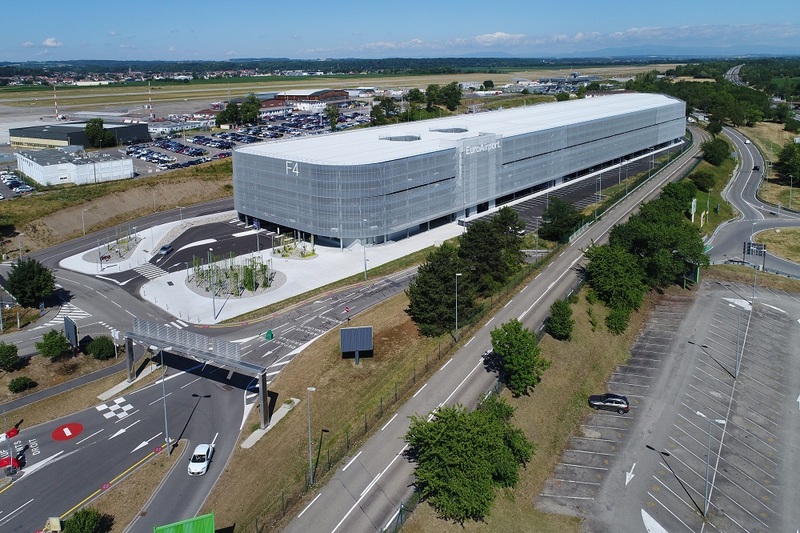 Joris Ide, a loyal customer of ArcelorMittal Europe – Flat Products, has in fact made Aluzinc® Florelis its choice on many occasions for projects such as the Bressuire shopping centre, a housing development in Paris and the construction of a kit house in Alsace. An initial test was successfully run on a prototype submitted for validation. In creating this prototype, Joris Ide and Gagnepark had examined the protocol in detail and given careful consideration to a number of factors, including inertia, resistance, perforation, suitability for a seismic environment, and the special fastenings required because of the high degree of perforation. 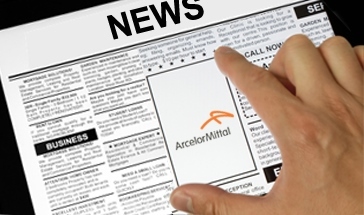 They also discussed the extended guarantees with ArcelorMittal. In addition to the technical requirements, the production deadlines were particularly tight, as the project had to be completed in 15 months. For this reason, Joris Ide, Gagnepark and ArcelorMittal worked very hard together on the planning stage. “All the material was produced in a single run to ensure a consistent quality and finish for the whole order,” explained Patrick Ryckeboer, who was in charge of the project at ArcelorMittal Europe – Flat Products. Aluzinc® Florelis is known for its strength, but it is also a very beautiful material. Its silver finish and spangle reflect the light to give a wonderful sparkle effect. The natural and mineral quality of Aluzinc® Florelis tends to be popular with architects because it provides a modern, yet understated finish that blends perfectly with different types of surroundings. Because of its excellent resistance to atmospheric oxidation, Aluzinc® Florelis does not lose its natural colour or shine over time. It also has a transparent organic Easyfilm® coating, which is eco-friendly and does not require any other special treatment.